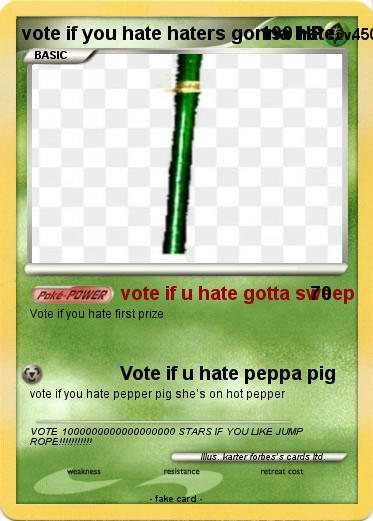 Comments : VOTE 1000000000000000000 STARS IF YOU LIKE JUMP ROPE!!!!!!!!!!! Illustrator : karter forbes’s cards ltd.
Haters gonna hate | Haters Gonna Hate | Raccoon trollface | Snivy | chuck norris | haters gonna hate | Magikarp | Pikablu | haters gonna hate | haters gonna hate | Damit | Awesomeness | Awesomeness | Hater | Voltaire | Katy Perry | Baby Rattata | Zoroark EX | Jayy Von Monroe | Mega Chespin | Dhan Ryan Guiñes | Team Galactic's haters gonna hate | haters gonna hate | Starter Pokemon Band | Vote=hate JB | vote if you hate justin bieber | haters gunna hate | Justin Bieber hate or Hate | Vote if you hate Him | Haters gonna hate | Quakin lv.X | Bidoof- Haters gonna hate | Haters Gonna Hate | Vote if you hate trump | Vote 5 Stars if you HATE Yahoo | Vote if U hate Justin Bieber | vote 5 stars if you know 1+1 | Vote If U Hate Yahoo | Vote if you Hate Bieber | VOTE IF U HATE HIM | vote then you hate justinB | Vote if you hate jb | Vote if you hate TTG | Vote if you hate Justin Bieber | vote if u hate justen bieber | Like Or HATE | Like OR HATE!!!! | Vote if you hate FNAF | vote if you hate justin | vote if you hate google+ | i hate justin bieber | vote if u hate brocoli | Vote if you hate Justin B | vote if you hate l.a lakers | vote if you hate diego | vote if you hate jb | if you hate Jake | vote if you hate windows 10 | Vote if u hate JB 1+1 | Vote if you hate lady gaga | justin ugly beiber | do you hate justing bieber | justin bieber vote for me if you | Vote if u hate Nick Jr. | vote if you hate JUSTIN | VOTE IF YOU HATE | Vote if you hate Justin | HATE Justin Beiber E.X. | Vote if I hate Justin Bieber | I HATE Mica the penguin!